The 3D perception and mapping problem are very closely related with the robot localization and has not been yet solved up to a degree that allow AUVs to interact with complex environments safely. By providing AUVs with better 3D perception and improving their localization the usage of AUVs in tasks such as Inspection, Maintenance and Repair (IMR) can increase. Since these tasks are currently done with Remote Operated Vehicles (ROVs), this would produce an economical impact in the operational cost because AUV operations are cheaper than ROV ones. This thesis presents different solutions to the 3D perception and mapping problem using acoustic and laser sensors. The first part of this thesis presents a full 3D EKF SLAM using a multibeam echosounder. In this algorithm, the swath profiles of the multibeam are combined with the robot DR navigation to produce sub-maps of the area to explore. The central position of each sub-map is stored in a pose-based EKF SLAM. When two sub-maps are overlapping, a pICP registration algorithm estimates their relative position. This algorithm coarsely aligns the sub-maps using a point-to-point error metric and then, it uses a point-to-plane error metric to refine the alignment. Moreover, the association complexity of the pICP is decreased from O(n2) to O(n) using an heuristic based on the probabilistic representation of points. The results of the pICP registration algorithm are used as observations between the different positions in the EKF. This SLAM framework is tested in different experiments using either a down-looking multibeam configuration producing 2.5D bathymetric maps or with the multibeam mounted on a pan and tilt actuator scanning from a down-looking to a forward looking configuration producing 3D scans. 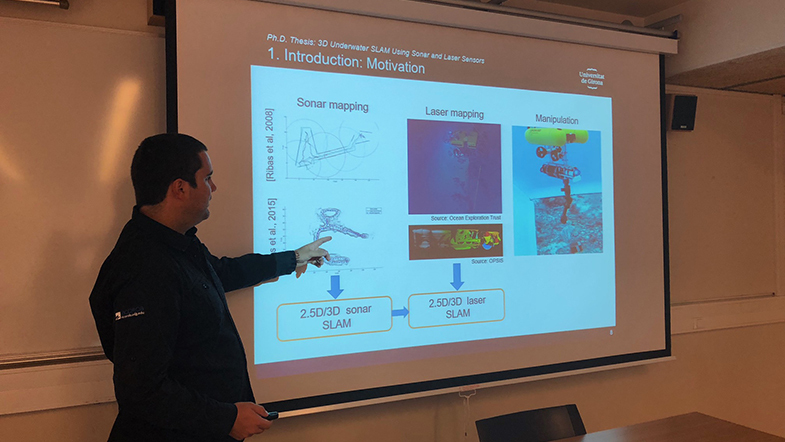 The second part of the thesis presents a new underwater 3D laser scanner to increase the 3D perception resolution, accuracy and frame rate when compared to the multibeam echosounder. The underwater laser scanner consists of a camera and a laser line projector that is scanned across an area of interest using a mirror actuated with a galvanometer, both sealed with flat viewports. The use of flat viewports produce distortion in the projected laser light. This deformation is studied by proposing a ray-based model of the sensor. In this thesis we propose to use an elliptical cone to represent the surface where the light travels underwater. The elliptical cone represents the underwater laser light better than a plane (the surface used in similar underwater laser scanners) because it can represent the overall curvatures of the projected light, including a straight line. Then, we propose a calibration procedure to estimate the parameters of the ray-based model as well as the elliptical cones for the different incident angles between the laser and the viewport. The experimental results show that the scanner has a sub-millimetric precision and that the use of an elliptical cone not only produces a better representation of the underwater light than a plane, but also outperforms the triangulation using the ray-based model without losing accuracy. Finally, the thesis presents two practical applications of the newly developed underwater laser scanner. First, we use the scanner in a pose-based EKF SLAM where the position of different scans are corrected using a feature-based coarse registration refined with an Iterative Closest Point (ICP). The developed EKF SLAM is tested in an inspection of an underwater pipe and valve structure with the Girona 500 AUV and the laser scanner in the water tank. Second, the scanner is used in conjunction with two different underwater manipulation systems. The first manipulation experiment uses a fixed-base 8 DoF manipulator with the task of moving cyclically through 3 different way-points without colliding with the a priory unknown objects in the scene. In this experiment, the scanner is used to update the map that the planner uses to compute safe trajectories. 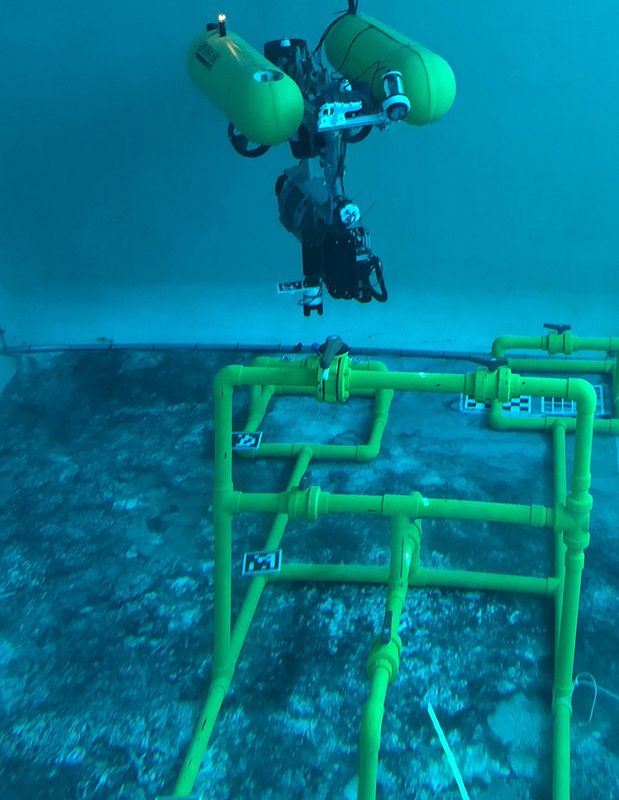 The second manipulation experiments uses a 4 DoF manipulator mounted onto Girona 500 AUV to pick up an amphora from the bottom of the water tank. In this experiment the scanner is used to detect the amphora pose and compute the grasping approach pose as well as the grasping pose.